SYOSSET, N.Y., Dec. 12 /CSRwire/ - Founded in 1973, DeCicco Family Markets combines the best selection of food and products, with a lot of hard work, customer satisfaction, and superior service. DeCicco’s has gained a reputation for being the food market of choice for those who have a serious love for food. 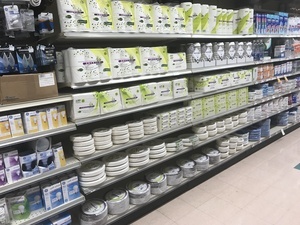 DeCicco has partnered with Emerald Brand to offer their customers at their New City, New York location, a line of eco-friendly products for their home or business. Emerald offers a unique line of sustainable disposable products created using Tree-Free™ and plastic-free technology. Products carried at this location include Tree-Free™ Bowls, Tree-Free™ 6" Plates, Tree-Free™ 9" Plates, Clay-Coated Select Design Plates, Tree-Free™ 3-Compartment Plates, FSC Certified® Select Hot Cups, Tree Free™ Luncheon Napkins, Tree-Free™ Dinner Napkins, Recycled Kitchen Roll Towels, Tree-Free™ Bath Tissue (12 Pack and 4 Pack), Pocket Pack Tree-Free™ Facial Tissues, and Flat Box Tree-Free™ Facial Tissues. Emerald paper products are made from Tree-Free™ rapidly renewable agricultural fibers like bagasse, bamboo, and wheat straw. In addition to protecting the environment and combating climate change, Emerald Brand is dedicated to the health and wellness of their customers, and the planet as a whole. All disposable products are made out of natural, chemical-free ingredients, ensuring a high quality product, with no health risks. Started in 1973, in a tiny storefront in the Bronx, Frank DeCicco slowly but surely grew Decicco Family Market into the thriving business we know today with the help of the rest of the DeCicco family. Only the finest produce, the best quality meat, the freshest seafood, the most diverse grocery, and the best prepared deli selection suffice. However, the premium quality doesn’t stop there: We also feature some of the most vast beer and cheese selections in the Westchester and Rockland county areas, with varieties numbering in the hundreds and with places of origin that span every corner of the world.